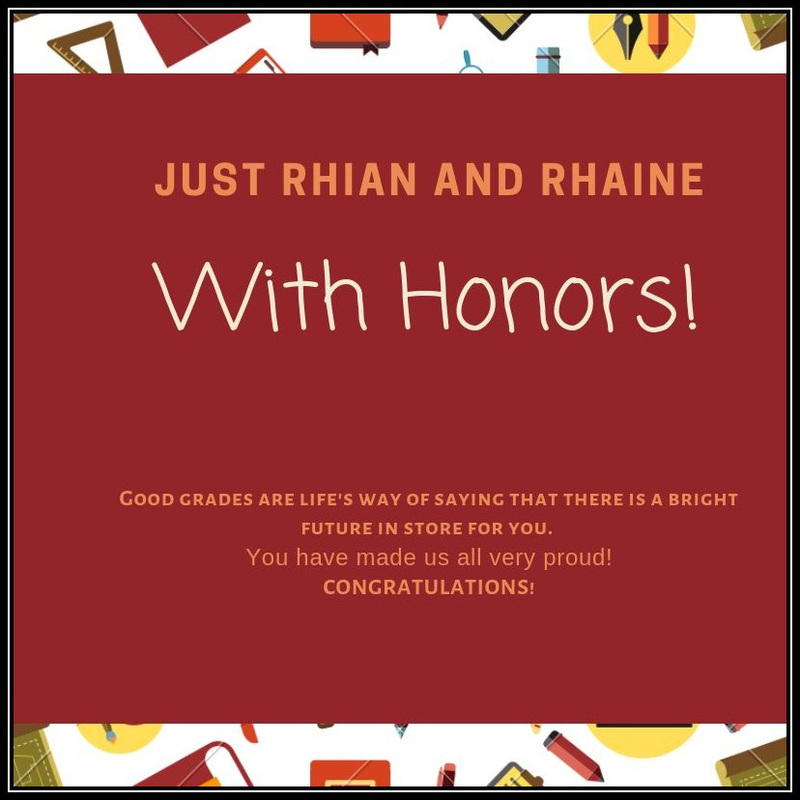 Home diaries JustRhianandRhaine Just Rhian and Rhaine: Congratulations, Kids! Just Rhian and Rhaine: Congratulations, Kids! Sorry for not updating this blog, I’ve been so busy lately from work (board meetings), households errands, extra-curricular activities and of course busy building a #ProjectHappyHome with my little family. Also, we’ve been busy preparing our first Christmas celebration at our #TeamVillarealHome so I wasn’t able to update the #WhereToEat portion of this blog, but promise I will post new reviews hopefully by 1st week of December. (Cross fingers) For now, let me share with you one of my children’s achievement this year. Wala lang nakakaproud lang! As in! 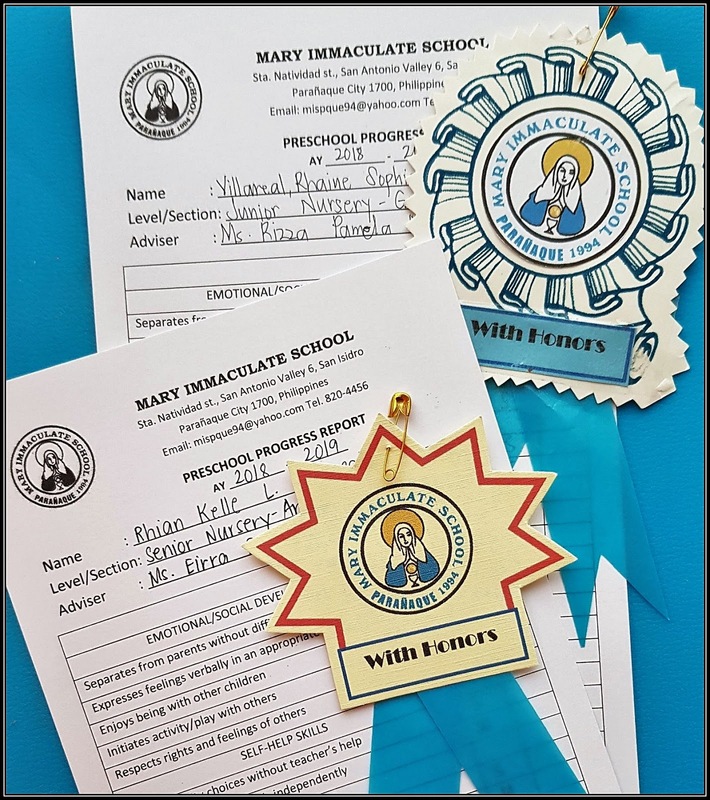 Iba pala talaga when you see you child doing very well at school. Yung alam mong nag tututo sila at the same time nag eenjoy in what they’re doing, for me its my achievement. I never expect too much from my kids as a student, for we know they will fabricate stories just to please us. I also mentioned in my facebook post that I don’t oblige my children to do their homework lalo na pag ayaw nila or wala pa sila sa mood. Di ko sila pinipilit na sagutan yun not until nasa condition na sila. Just like we did during their first semestral exam, I told my auntie not to force them to study instead let them what they want to do, but remind them also the importance of going to school and doing their homework. In fact, it works. It really works. So how we did it? Let me share you my tricks. My kids took their afternoon nap, had their merienda and start doing their homework/review. If they got bored, they will go to the playground or take a dip on the pool. They will eat biscuits again while my auntie prepares the food for dinner. (Usually, kung anong lunch naming yun narin ang pang dinner). At 7pm, they will have their dinner, watch television and take a quick shower. As soon as we arrived, I am in-charged with my children, I will review their homework, kwentuhan and kulitan then it’s time for their 1-hour movie/youtube time. This is the time I will do my other chores at home. Yes! Ako ang babaeng walang pahinga, yung hindi ko alam ang ibig sabihin ng pahinga. Yung di ko na alam pakiramdam ng maupo sa sofa at mag relax, but it’s okay for me. I consider it as my blessings kasi I know that I can do things and wala akong sakit. Anyway, back to our topic. After their 1-hour movie/youtube time, review time again or sometimes they want us to play. Who I am to refuse? By 9:30pm its reading time, I usually read them story books e since kabisado na ata nila lahat ng binili kong books, ayun nag sasawa na sila and since I have creative mind, nag iimbento nalang ako ng story for them, of course yung may moral lesson rin. As a mom, I know what they like and they don’t. I know what makes them happy and I know what makes them sad. I know their strength but I also know their weakness. I know their limitations and I know their attitudes very well. But one thing I don’t know about them is how they perform and how they interact with their teachers and classmates at school. Pag may chance, tinatanong ko yung teachers nila, or sometimes pinapatanong ko kay Tita. 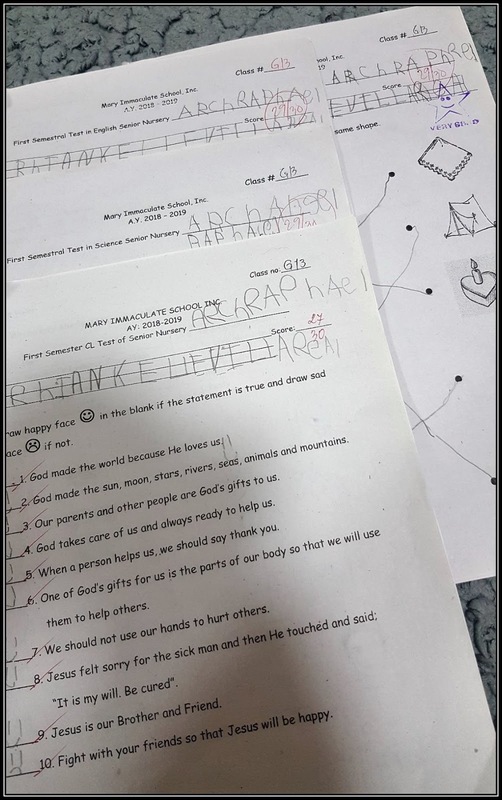 According to their teachers, my kids are very shy at first di sila tulad ng ibang bata na at first magiging jolly na sa unang pagkikita palang, sila hindi kasi mahiyain sila. As in it will take time for them to cooperate or to be comfortable with you. According to their teachers, Rhian and Rhaine are very respectful kids as they respect other people especially their classmates. Nakaka proud marinig yun sa teachers nila. I told the teachers that we teach them respect at home so they will know how to respect other people. Iba na mga kabataan ngayon, mabilis na silang turuan at mabilis na nilang naiintindihan ang mga bagay na gusto nating ituro sa kanila. We also allow our children to make mistake, most of the time I told them that it is okay to make mistakes because they will learn a lesson from it. I’m glad that my children understand all the things that we said. When I got their report card, I really surprised that my kids are doing very well at school. Both with honors and got a highest score in exam. 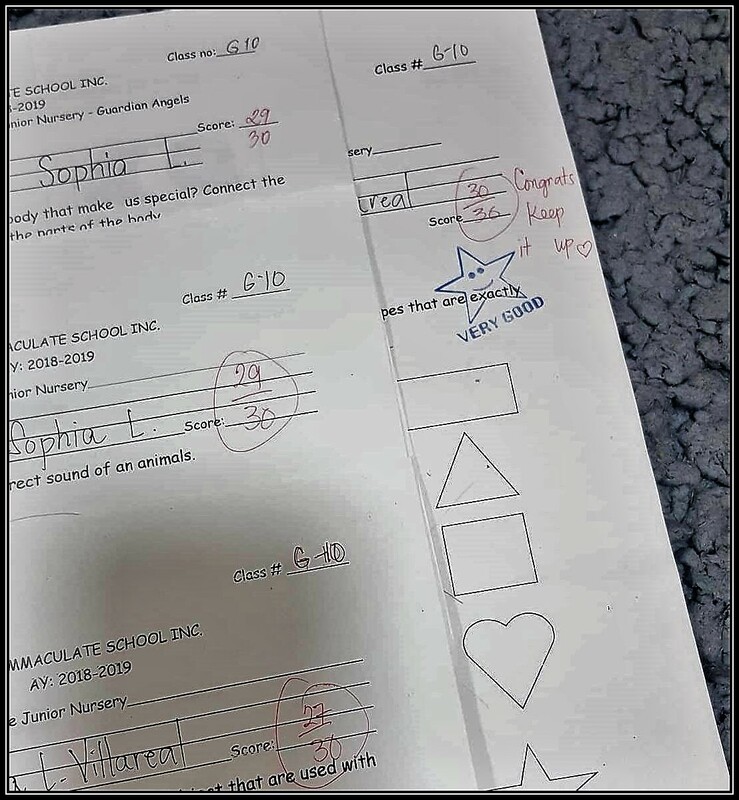 Si Rhaine nga may perfect score pa, knowing my child is only 3 years old. Galing! To be honest, for me and my husband, high grades are never the bases of their future, it is their character that we carefully nurture them the way God has designed them to be. We all know that parenting is never easy but my husband and I decided to help each other in raising happy children. 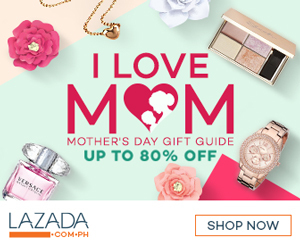 I don’t compare my kids as they have different personalities, magkaiba sila pero meron rin naman silang magkatulad, parehas silang matalino, mana sa nanay syempre. (I know my husband will react on this. Haha). We never let our children compete with others for we know that they will grow with insecurity and somehow may hurt themselves in the process. I’m so proud of my children. Ganito pala ang feeling na nakikita mong lahat ng pagod mo sa work para may pambayad sa tuition fees nila are all worth it. I know nagsisimula palang kami, we still have more or less 18 years to work hard before they got permanent job. Kaya we look our children as our inspiration in our life. They are my strength when I almost give up, when I can’t handle our problems. Seeing them everyday is one of the greatest blessings we have every received.